Decorating your master and guest bedroom can be a challenge. To help you gather some fresh ideas for your next bedroom makeover, here are 17 different bedroom blog posts featuring bedroom decorating ideas. 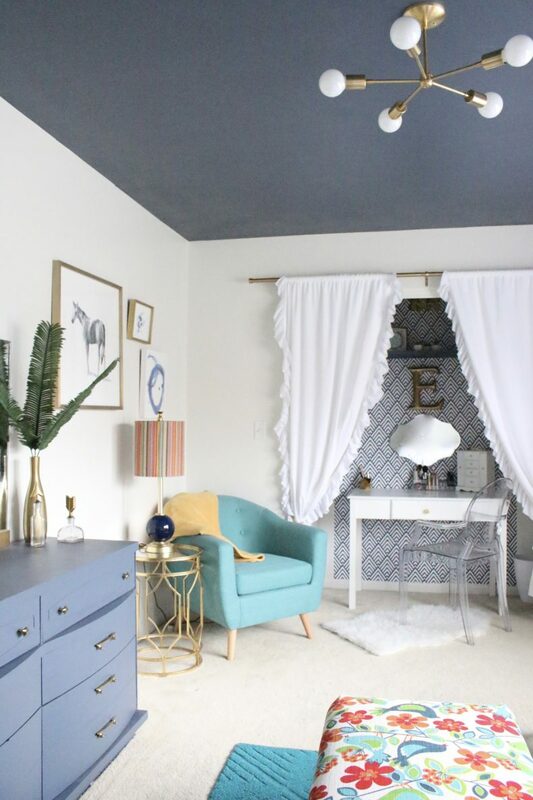 Thank you to all the bloggers who linked up their bedroom reveals and makeovers. Be sure to click on the blue/gray links to be taken to your favorite rooms and pin them! 1. White bedding is always a good idea! 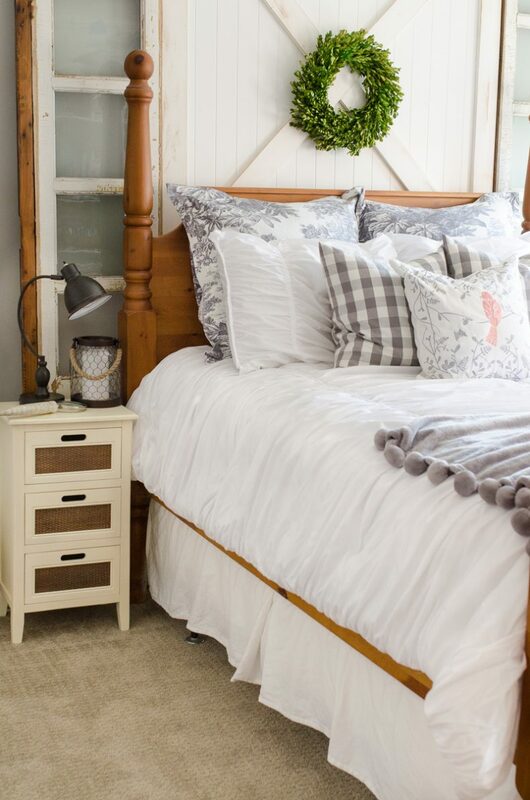 To add some farmhouse flair to the bedroom, you can’t go wrong with white bedding. White bedding provides a wonderful and crisp backdrop for your bedroom and allows you to add interest through texture and pops of color. I love this inexpensive white ruched bedding found at Walmart! 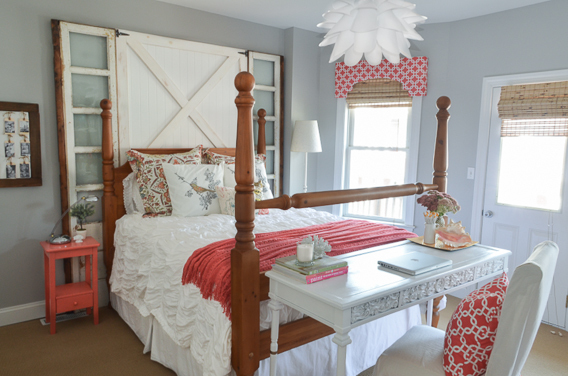 The DIY barn door headboard can be found here. 2. Add a pop of color to create a visual focal point. A great way to spice up your bedroom decor is through a bold pop of color. 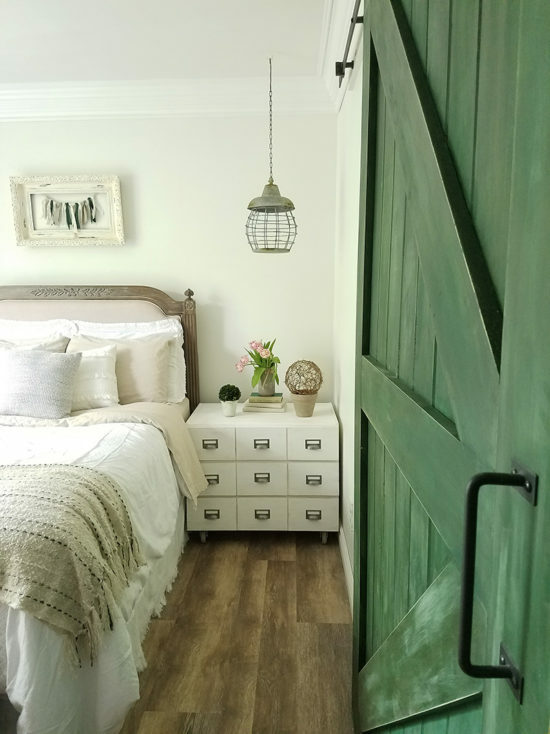 I love how The Honeycomb Home added architectural interest and color to an otherwise neutral bedroom with a gorgeous DIY barn door! 3. Keep a tight color palette for a classic and effortless look. When filled with decorating doubt, fall back on the security of a tight color palette! Blue and white is always beautiful and classic. 4. Always add architectural interest. A feature wall in your bedroom creates a focal point for your space and adds a layer of interest. Shiplap, wood planks, faux brick, or wainscotting are all great options to explore. This plank wall was easy and relatively inexpensive to create. Click below for the full tutorial. 5. Use unexpected items when decorating. 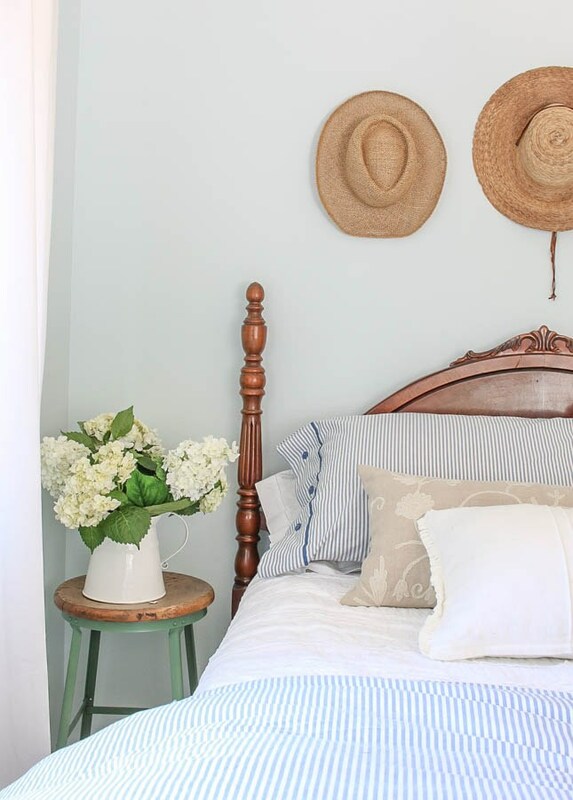 A vintage stool used as a nightstand and a collection of straw hats on the wall are what set this bedroom apart! Don’t be scared to take risks when decorating and utilize unexpected items in your decor. 6. Don’t forget the “fifth wall”. Ceilings are often referred to as the “fifth wall” and should not be ignored. 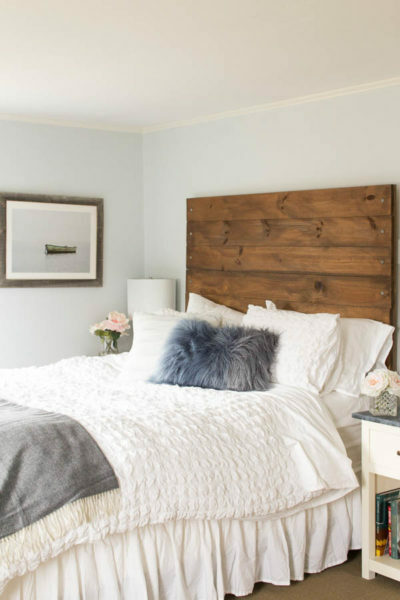 While your eye naturally goes to the beautiful stenciled wall by Making it in the Mountains, her gorgeous plank wall also adds subtle charm and character to the bedroom, adding to the farmhouse charm. 7. Less can be more. 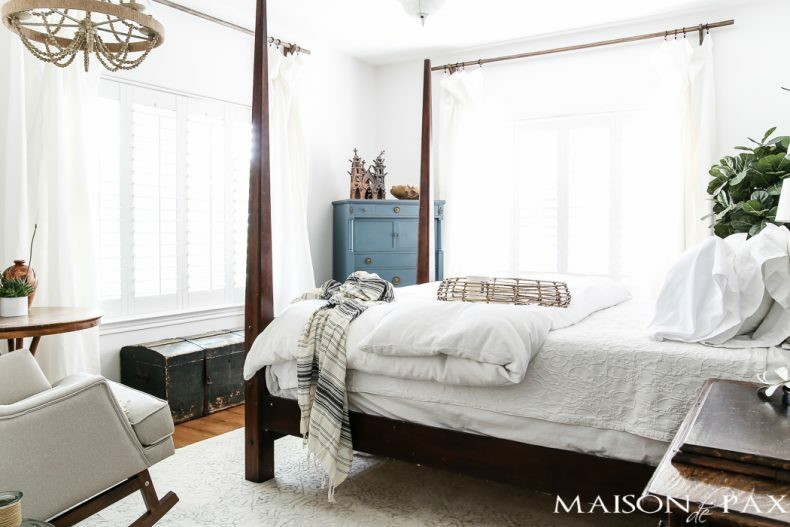 Keeping an all white palette in the bedroom is soothing, relaxed, and homey. Try using a minimalist approach to decorating in the bedroom to keep clutter at bay. 8. Create your own decor. 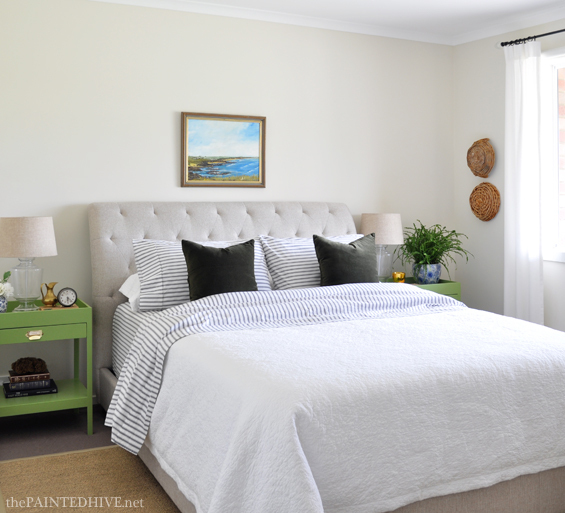 DIY headboard tutorials are a brilliant and economical way of adding warmth to your bedroom. 9. 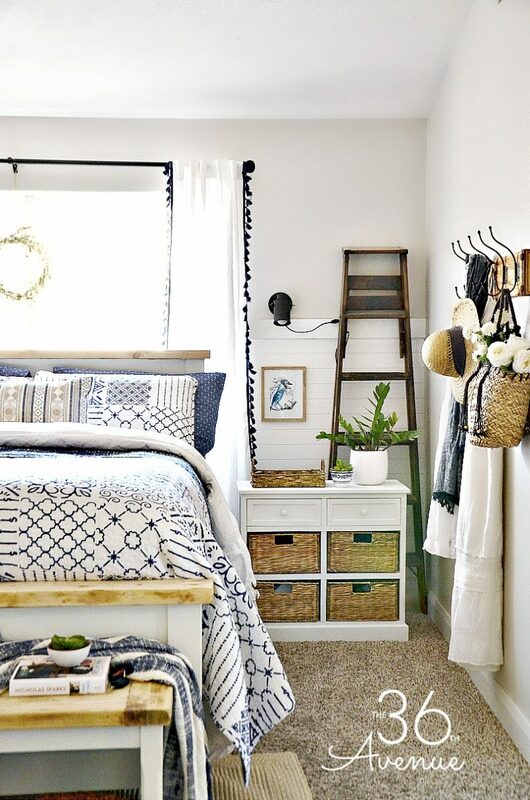 Add a rug to your bedroom. 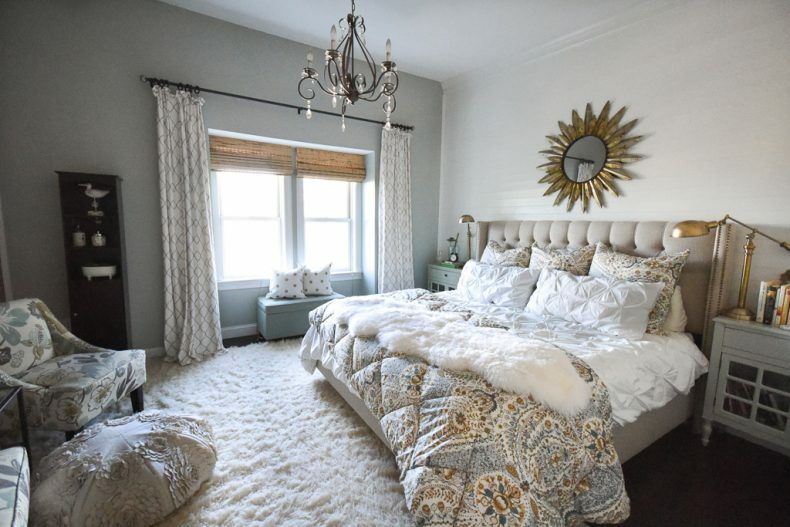 Whether you have hardwoods, tile, or carpet on your bedroom floor, adding a rug to your bedroom floor adds an instant layer of cozy! 10. Work with your bedroom windows. Placing a bed in front of windows can be gorgeous! 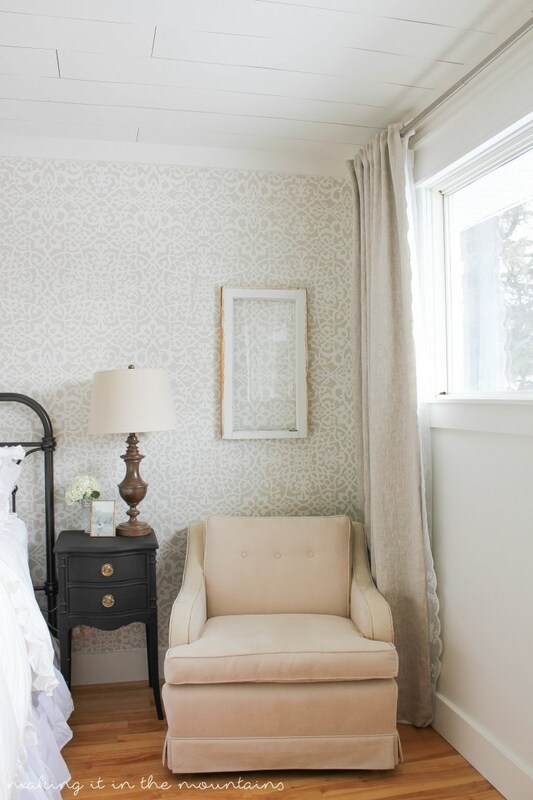 Hang your curtains high and wide to create the most visual impact and center your bed between your windows. 11. Make your space work for you. Need a workstation in your bedroom? Consider converting a closet into a “cloffice“. I love how My Life from Home added removable wallpaper and curtains to her daughter’s closet turned closet office. 12. Place a bench at the end of your bed. 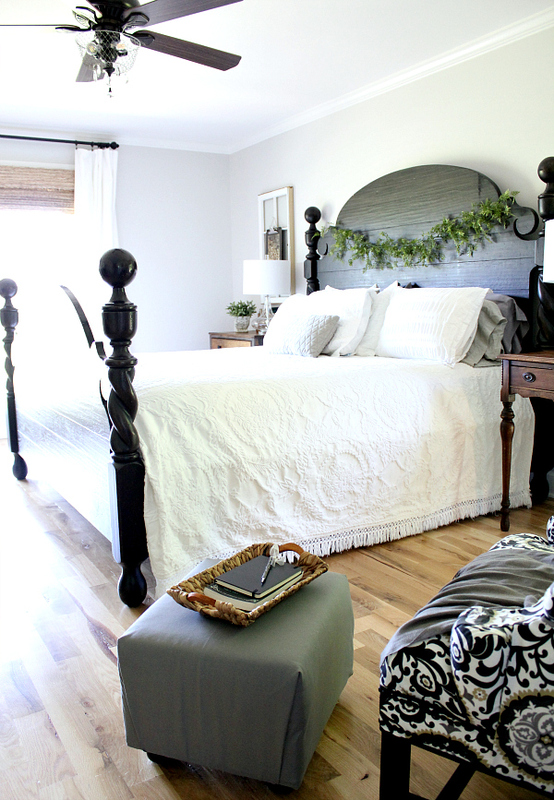 End of the bed benches are a beautiful way to finish off the room, add additional seating/storage, and provide a place for you to put on your strappy heels! 13. Sneak in a desk. Our guest bedroom needed to work double time as a library/office. Adding a desk to the end of the bed allowed us to make the most of the space. 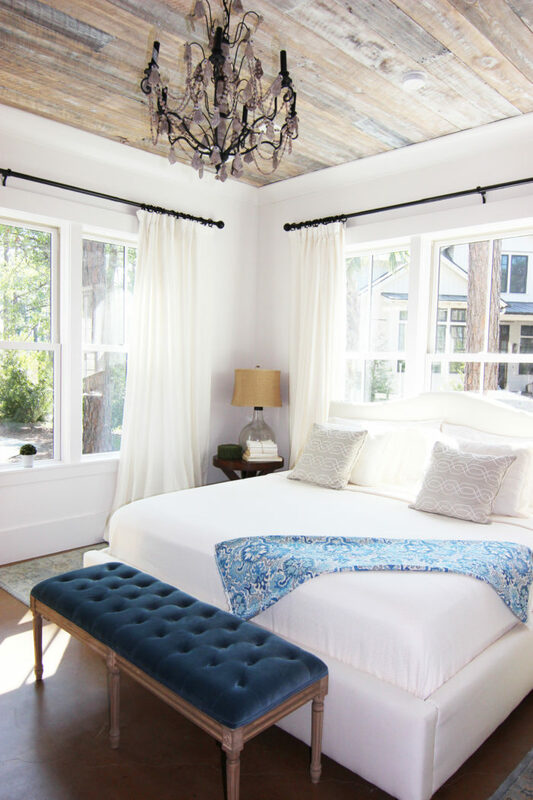 The barn door headboard can be found here, and the window cornice boards can be found here. The coffee table turned desk can be found here. 14. Paint your nightstands a new color. The green nightstands are unexpected and add pizazz to otherwise safe and neutral decor. If you’re craving a change, try painting your nightstands a bold color for a fresh look. 15. 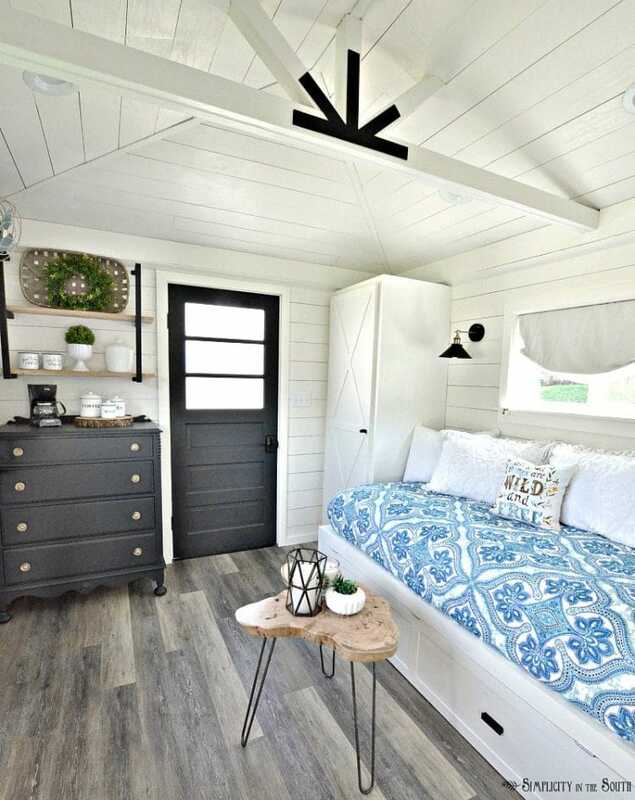 Try a daybed in a small space. 16. Pair light and dark colors for high contrast decorating. Infuse your rooms with chic and cozy vibes by choosing wood tones and paint colors that contrast with one another. Light walls and dark woods look beautiful together. This is a guest room in my Mom’s beach house. The updates were simple, but made a huge impact! Go see the before and after to get all the sourcing information – including that super cute pillow! A good rule when picking out expensive pieces for your room, make those pieces neutral so they can match different color schemes and styles so you can change things around. Wonderful tips for decorating house with an elegant look. 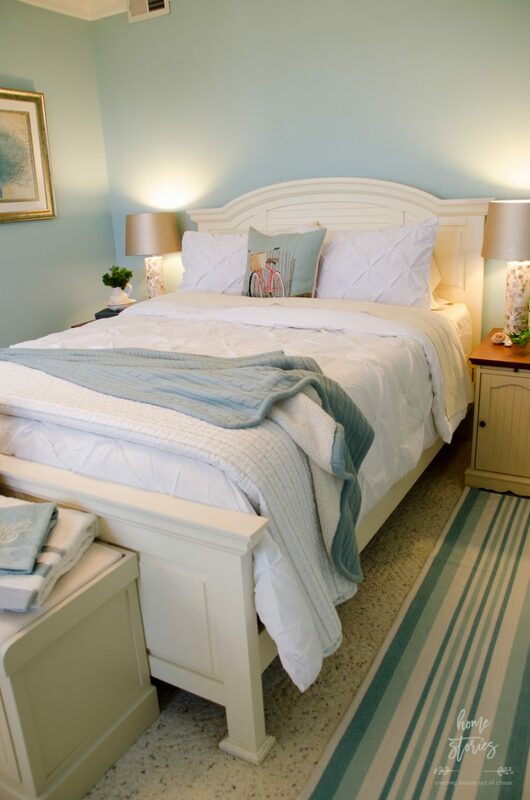 I would like to go with the idea of adding rugs to my bedroom and the white-blue combination, it’s simply beautiful. All the ideas are wonderful. I like to decorate my room with colorful curtains, wind champ and fluffy rugs. Thank you for these wonderful ideas! I wish I found your site before I wasted money on print duvet I don’t like. I look forward to looking through the rest of your ideas. Thanks for stopping by Margaret! And sometimes in decorating you have to just try something and bring it home first to know if you like it or not. Great collection of ideas. Each one is as inspiring and beautiful as the next. Thanks.